One of the best things about not only being a blogger, but an artist, is all the great people I get to "meet". Be they in person or on the web, this is definitely a huge benefit that I really wasn't expecting. I'm seeing more than ever that there's a reason they call it "the world-wide web"as it unites people with common interests from all over the world and provides such a rich opportunity to exchange ideas and information. I wish to thank Belinda Graham, an Australian writer, who writes for Real Living Magazine and is also their web editor. I ran across her blog, Renovate and Decorate, for the first time this week and was intrigued by her home and her adorable little baby. Thanks for the mention on your blog today, Belinda. Pop on over to Renovate and Decorate and check it out! 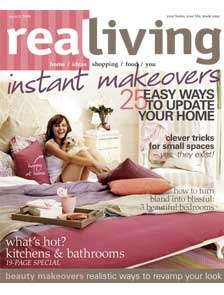 In "Australia", "Belinda Graham", "Real Living", "Renovate and Decorate"